The Monroe County Office of Mental Health (MCOMH) is committed to improving the health and quality of life of county residents who are affected by mental illness, developmental disabilities, alcohol and other drugs. Develops a comprehensive county plan for mental health, developmental disability and alcohol/substance abuse services. Allocates funding to local agencies based on community priorities, treatment outcomes, and program performance. Ensures coordination of services across levels of care and among an array of community providers. Assists in the transformation of our system to providing flexible services that are person/family centered, strengths-based, culturally competent, recovery-oriented and evidence-based. To accomplish these objectives, the MCOMH oversees the local service system through a variety of sub-contracts; provides fiscal oversight and technical assistance to agencies; and collaborates extensively with other DHS and county divisions, service providers, and community groups. Provider contracts are monitored by Coordinated Care Services, Inc. (CCSI) on behalf of MCOMH. Click here for more information about CCSI. 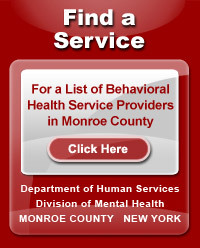 Identify services for mental health, developmental disabilities or alcohol and other drugs offered in Monroe County on this website. 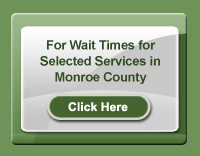 The Monroe County Office of Mental Health oversees the mental health system and provides funding to a number of community agencies for the provision of services to individuals with mental illness and their families. Mental Health services are available for adults, adolescents and children. Community mental health services are aimed at offering individuals and families treatment and support services that assist them in successfully living in the community, avoiding unnecessary hospitalization or out-of-home placement. For adult mental health care coordination and residential services, see the referral forms on the Adult SPOA Referrals page and contact the Monroe County Single Point of Access (SPOA) Manager at 753-2879. For child and adolescent mental health care coordination and residential services contact the Monroe County Single Point of Access (SPOA) Manager at 753-2881. The Monroe County Office of Mental Health oversees the Addiction system and provides funding to a number of community agencies for the provision of addiction services for individuals, families and the community. Services are available for adults and adolescents. Substance use disorder services are covered by most third party insurance plans, Medicaid and all OASAS licensed facilities have sliding fee scales. The Monroe County Office of Mental Health provides funding to a number of community-based provider agencies for the provision of services to individuals with developmental disabilities and their families. Developmental Disabilities Regional Offices (DDROs) are the starting point to apply for services. With an eye to enhanced oversight and quality improvement, the Office for People With Developmental Disabilities (OPWDD) has established 5 regionally based offices across the state that allow for better coordination of services with the State Office of Mental Health, State Department of Health and other agencies with whom we often partner in providing services. In order to assist individuals and families to make informed choices about the supports and services best suited to their needs, DDROs work with local voluntary provider agencies to improve access to and coordinate services within a region. Eligibility for services is determined by the Developmental Disabilities Regional Offices(DDROs). Please contact Joanne Beardslee of the Finger Lakes Regional Office at (585) 241-5741 or Joanne.Beardslee@opwdd.ny.gov.